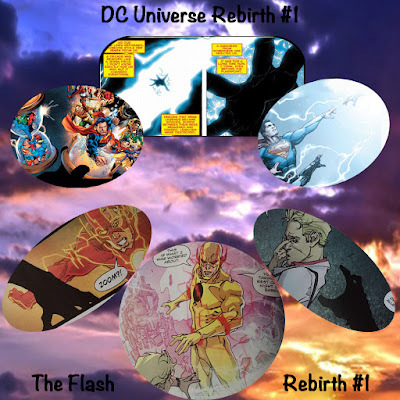 Two weeks ago we've entered a new dawn in the DC Comic Universe with Rebirth #1! Since then several new comics have begun, but none has equaled a direct sequel to the reality changing issue. 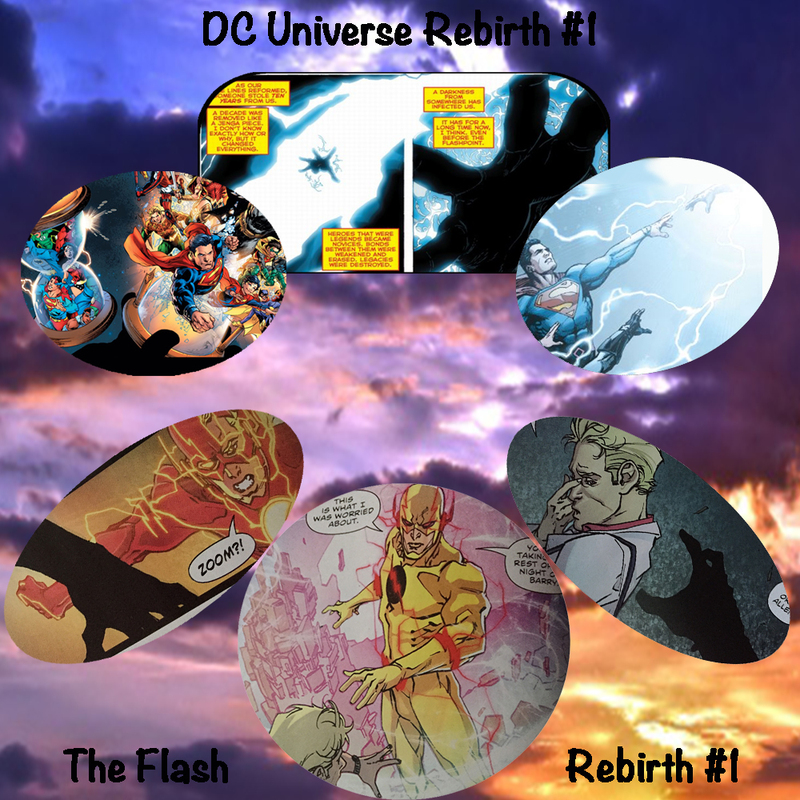 Most of the new stories, while affected by Rebirth, hasn't directly dealt with the events that occurred during it. 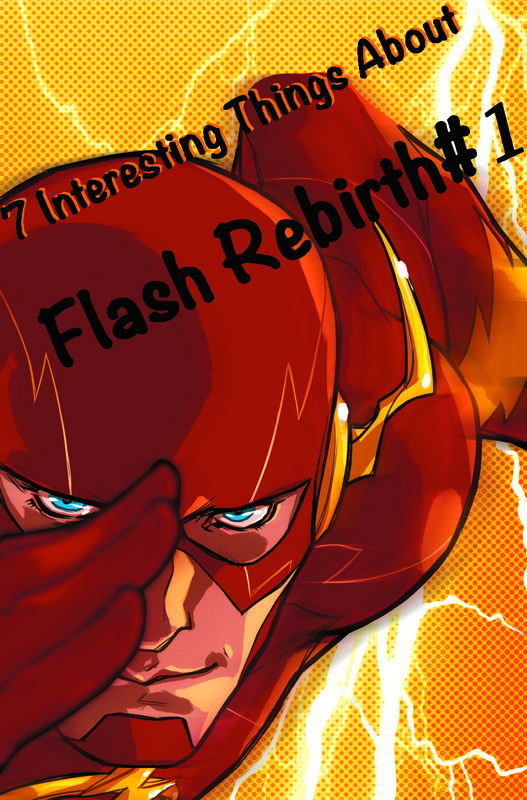 Flash Rebirth #1 is the first to actually reference the events and as FlashGirl, I just had to write about it! In this issue of Flash Rebirth #1, we begin with a crime scene. A woman stabbed to death, in front of her young son, and the detectives are already suspecting the husband. 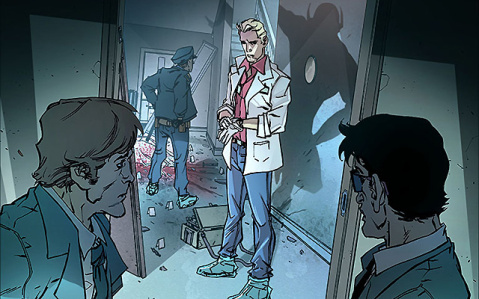 For a moment we wonder if we're having a Flashback of Barry's childhood, only to turn the page and see an adult Barry as the CSI for the case. In the DC Universe Rebirth #1, we see Wally appearing to Barry and Barry pulling Wally out of the SpeedForce; what we didn't see is the before and after, that's where The Flash Rebirth #1 comes in. 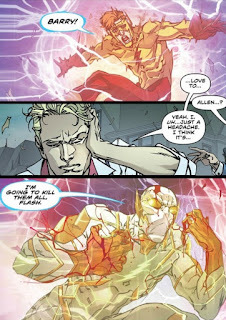 Before Wally appears to Barry in DCU Rebirth, Barry was having SpeedForce inducing visions from the past (Reverse Flash), present (Wally), and future (GodSpeed). 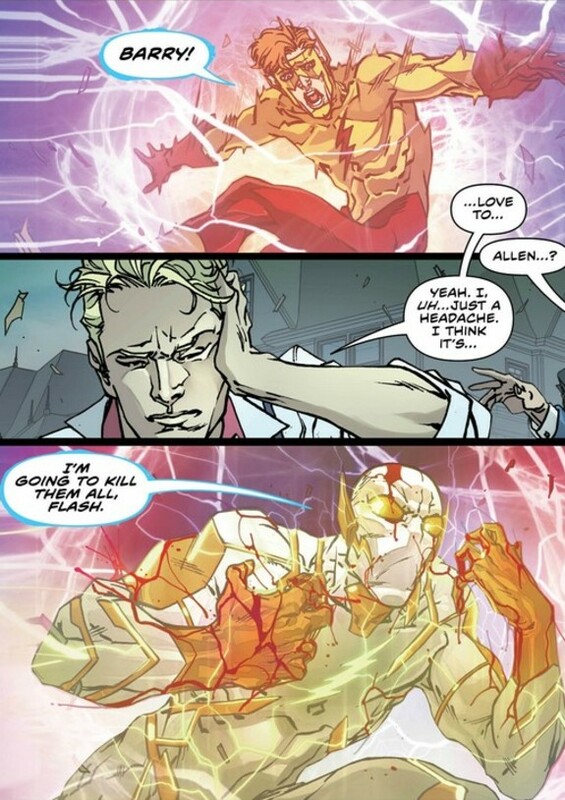 Barry is one of the only characters that could actually remember any thing from before the New 52 reality because he is one of the only characters that could and did change reality. 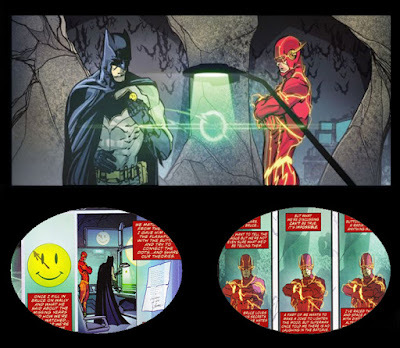 The Flash changed reality during Flashpoint and when things were changing back to it's original timeline at the end, someone else hand dipped in and altered things. Speaking of hands, that's number three on the list! 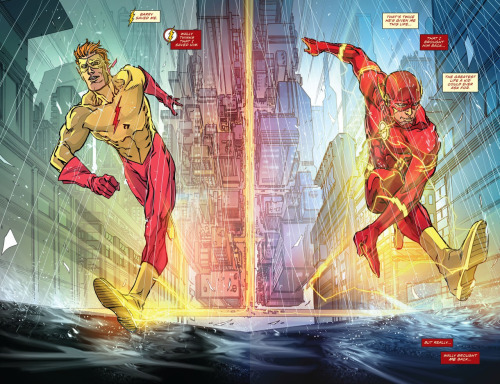 Throughout Barry's SpeedForce visions, twice we see a silhouette of a hand reaching through. 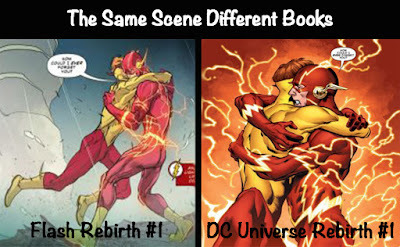 It's revealed to be the hand of his nemesis, the Reverse Flash, but the similarities of the reaching hand in both DCU Rebirth and Flash Rebirth is uncanny. 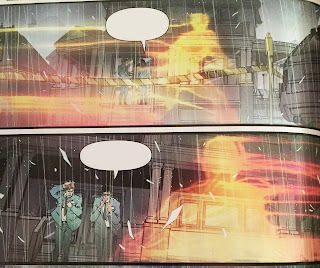 It might speak to the fact that the Reverse Flash has changed Barry's Reality, like the owner of the mysterious hand in the DCU Rebirth issue has changed Reality for everyone. 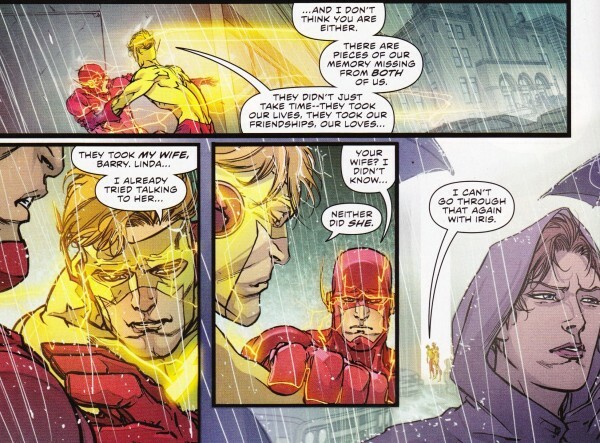 The reunion between the two speedsters was so heartfelt, it was too big for just one issue. 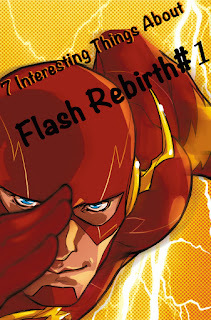 While the DCU's Rebirth issue was primarily from Wally's point of view, The Flash Rebirth issue was from Barry's point of view. The one thing you should know about speedsters is that they have heart! The relationships they have with family, friends, and even strangers are strong with hope, care, and love. It's nearly unmeasurable, much like their speed. As they run their separate ways the gratitude they share for each other, tells us how much they care for one another. 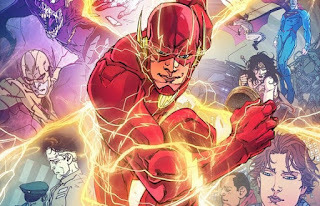 Similar to the Flash Rebirth of 2009, when Barry came back and then raced away to protect his loved ones and find out what was wrong, Wally decides to leave as well. Central City, the hometown of the Flash, his Aunt Iris, his younger cousin Wally, the Rogues, and so much more drags up so many things for Wally and none of them would remember him. After his encounter with Linda, Wally is just not up to being Wally West, aka. Kid Flash, partner of The Flash because no one knows him as that. That version of him does not exist, and his heart is too big to handle that type of rejection. He believes it'll be better for him to leave and connect with others that'll understand, his friends and heroes: the Titans. They'll help him Hunt down the one responsible for they're stolen years. As Wally prepares to leave Barry tells him, "You're not Kid Flash anymore, You're a Flash!" With that title, Wally will need a new suit which we'll see in true comic book action next week in Titans Rebirth #1. 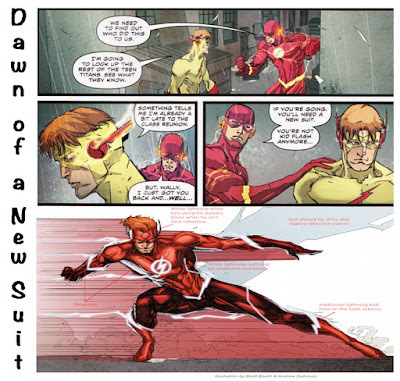 In Issue #5 of Flash Rebirth of 2009, Wally showed Barry how to use the SpeedForce to create a new suit, Wally reminds Barry of this trick in the current Flash Rebirth. Using the Speedforce to create his suit, Wally will dawn a red on dark red suit with white hot lightning accents for his debut in the Titans! Just seeing these two great minds working together is a great honor! The amazing respect Barry has for Bruce is summed up in a fantastic quote, "Everyone thinks of Bruce as a detective, but to me, he'll always be a scientist." They spend hours going over Barry's story and the evidence around the button and the letter. They might not have a definitive answer, but in time and with the help of the Titans, hopefully they'll solve this mystery. Could GodSpeed have been apart of the mother's murder? In the mean time, what's your theory? Or what was your favorite part of this Issue?